Most manufacturers of ultralight shelters love to put all sorts of contraptions on their shelters that inhibit ventilation and views, which I think are the two most important attributes of the basic tarp setup. You name it, they’ve thought about how to destroy ventilation and views: doors, flaps, beaks, nests, awnings … the list goes on. So before you moan in agony the next time a little snow starts blowing in your beakless tarp, consider instead what you might not be using that could serve … well enough. 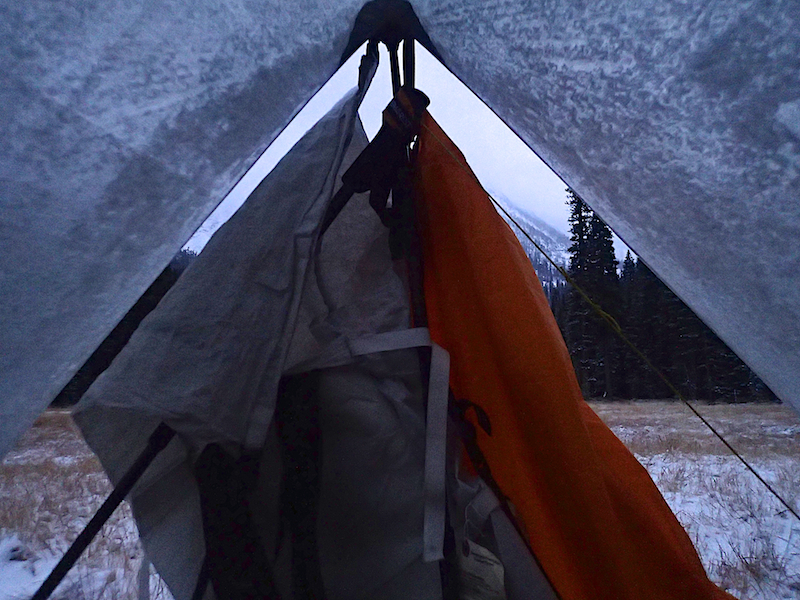 For me recently (see photo above), a snowy night in a windy meadow meant that I had the opportunity to rig a bead curtain door thing to the front of my tarp. I lashed my free trekking pole near the top of the front ridge pole, and stuck the other end down on the ground angled down. I then tied my pack to the two poles, and added a spare inflation bag to the other side, anchored to the ground by a piece of extra guyline cord and a Snowclaw (not shown), secured by a stick shoved into the meadow grass roots. I slept fine. Especially after I buried my head inside my windshirt body for full coverage, since I didn’t have a bivy sack. Earplugs topped it off, then I wouldn’t have to awaken at the wind howling up in the tree tops right before it slammed into my tarp. I know, it sounds dramatic, but it really isn’t. It’s just your basic ultralight ethos. Doing awesome things with what you have, so you can be graceful as you travel through wild places.